Should I fly or should I drive? I have to decide regularly between flying or driving as my transportation method. I also have to consider my travel budget. I have to think about the amount of time, the cost of getting from my origin to my destination, and my flexibility at the destination. For me, the origin is my driveway at home, and the destination is where I want to be. Before booking any flights or hotels and hitting the road, I like to know which is cheaper and time efficient, flying or driving. For the most part, travel time is unproductive. So I like to keep it at a minimum while bearing in mind the total cost which I’ll talk about later. I use two tools to determine my method of travel. The first is Google Maps to calculate mileage and drive time, and the other is a Fly or Drive Calculator I created in Excel. I use Google maps because I found it’s the most accurate and agrees with the GPS in my car. As an example, I’m going to take the driving time from my home in Kennesaw Georgia to Sharonville Ohio, a suburb of Cincinnati. According to Google Maps, car travel will take six hours and 42 minutes one-way. For many people, this is an okay drive and is the most economical way to go. Google maps also say it will take one hour and 25 minutes on an airplane. Many travelers will take this and go. But hold on, there’s a problem here. Google’s flight time is from leaving the gate at the departing airport to arriving at the gate the other end. It doesn’t include driving from home to the airport car park, taking the shuttle bus to the airport terminal, checking in, going through airport security, and having to be at the gate at least 30 minutes before departure. At the other end, it does not include disembarking the aircraft, getting your bags from baggage claim, renting a car and driving to your final destination. We need to add all these additions to the flight time to come up with a total amount of time it takes to make the trip from door step to door step. So, from my home in Kennesaw, it’s 38 minutes to drive to Atlanta airport without traffic. And we all know about Atlanta traffic. Once I’ve arrived at the airport, it takes another 30 to 40 minutes to park the car and take the shuttle bus to the airport terminal. The minimum check-in for most domestic flights for passengers with baggage is 45 to 60 minutes before departure. Going through security is included in the 45 to 60 minutes above so I won’t add it. So let’s take a look at time spent so far using the average duration’s quoted above. Driving to the airport, 38 minutes, plus parking the car and shuttle bus to the terminal, 35 minutes, plus the minimum check-in before departure, 53 minutes. That’s two hours, 6 minutes. Add the flying time from Google of one hour and 25 minutes and I’m at a total of three hours and 31 minutes. Once at the destination airport, in this case, Cincinnati, it’s an average of 30 minutes wait from disembarking the airplane to receiving my checked baggage at baggage claim. Then I have to rent a car; that’s another of another 30 minutes on average. Up to now, I’ve spent one hour and haven’t left the destination airport putting my total travel time to four hours and 31 minutes. Once in my rental car, I have to drive from Cincinnati airport to Sharonville Ohio. Google Maps says it will take me 32 minutes to make the trip. Without having any delays, my total travel time from home to my final destination is now five hours and 3 minutes. Now let’s take a look at driving. Starting at Kennesaw Georgia and driving to Sharonville Ohio takes six hours and 24 minutes according to Google maps. That’s one hour and 21 minutes longer than traveling by air. With this information, it makes more sense flying versus driving. But what about cost and flexibility? 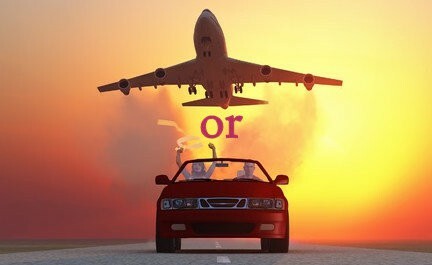 In comparing the price difference between flying and driving, you need to look at other expenses in as well as the price of the airline ticket and gas for the trip. First, I will calculate the total cost of flying for my Kennesaw to Sharonville trip. I need the price of the airline ticket for my journey. 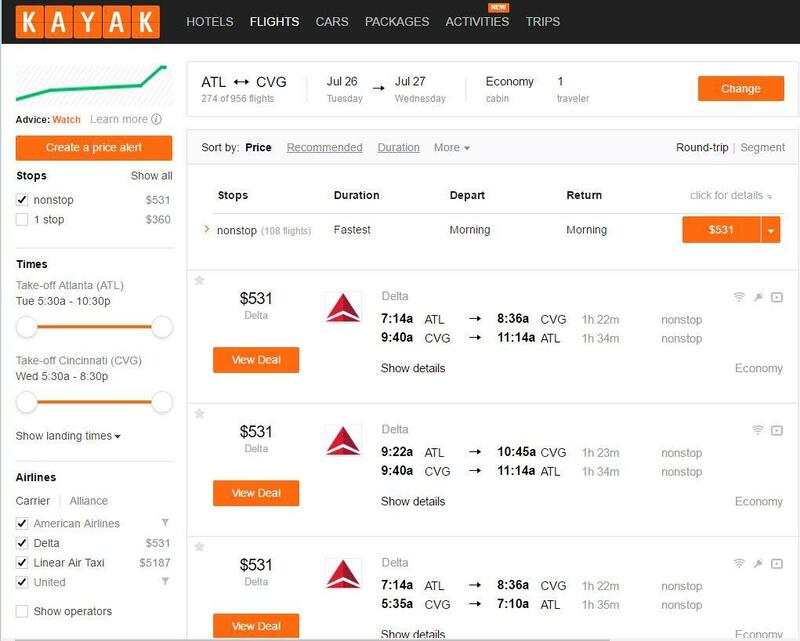 I found a ticket on Kayak.com for $531. But it doesn’t end there, I have to add other costs such as airline fees, the price of a rental car, fuel for my rental car, and I have parking to pay at my home airport. Add these together and you have an actual cost of flying. In my example, I took baggage fees at $25 each way, I found car rental on Kayak.com for $16.36 which is very cheap, I estimated car-rental fuel at $5, and parking at my home airport at $20. My total cost to fly is now $622.36. If I drive, I need to look at fuel economy, price per gallon, total miles to be driven, wear, tear and maintenance costs per mile. I also need to add any road tolls I may have to pay. My car has a fuel efficiency of 23 miles per gallon. The price of gasoline is $2.35 per gallon at the time of this writing. 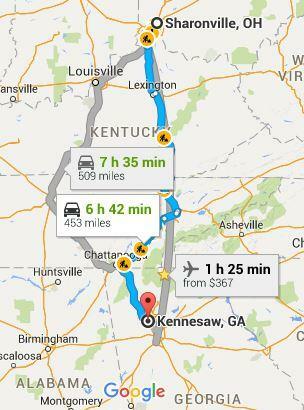 One-way mileage between Kennesaw Georgia and Sharonville Ohio is 453 miles. The average cost of wear, tear and maintenance is 3.5 cents per mile for my car. In doing the math, I come up with $62.14 one way, or $124.28 for the round-trip. Now I’ve got my total costs down; I need to look at the amount of time again it takes in the car versus flying. A day is only 24 hours long, at some point, I have to sleep. Now the question is: How many hotel nights do I need for a road trip, and how many do I need traveling by air? I need to include the cost of hotel stays to the estimated expenses. Also, I need to add the average cost of meals for the trip. So, I’ll take the hotel price of $96 per night and meals at $30 per day. Time wise, if I drove, I need two nights in a hotel versus only one night if flying. So to the driving expenses, I need to add $252, and $126 to my flight costs. Now I have an actual cost comparison between driving and flying of $376.28 and $748.36 respectively. Driving is cheaper versus traveling by air in this case. From a corporate perspective, I need to include the value of my time in the calculations. Let’s say for arguments sake and illustration, my per hour value for the company I work for is $300. If I take a road trip, it’s an additional $3,900. Whereas if I fly it’s an extra $3,360 in employee time value. In adding these two numbers to my driving and flying costs, I come up with a total of $4276.41 for driving versus $4108.36 if I jumped on an airplane. A $168.05 difference makes it cheaper to hop on a plane. It’s not much of a difference, but it illustrates my point. If you’re on vacation, you don’t need to worry about putting a value on your travel time. Another consideration I take into account is how flexible is it for me to make a change. When using air travel, I have to think about airlines schedules, change fees, and flight availability. Also, hotel room no-show or cancellation charges have to be taken into account. If I’m running late, I also have to worry about missing my flight. When taking road trips, I only need to worry about making changes to my hotel reservations. You can see that driving to your destination better for being flexible even though it may be cheaper to fly. I’ve created a Fly or Drive Calculator in Excel to help you decide if driving or flying is cheaper. It’s free, and you can download it by clicking this link. You can use it for a work trip or family vacation. If you use it for a family vacation trip, you will need to multiply cretin variables by the number of travelers. You are welcome to use it for budget travel calculations and to decide whether it’s better to drive to your destination, or fly. And your welcome to share with others travelers and friends. It has three pages: Page one is where you enter Trip Time Variables. Page two is where you enter Cost and Mileage Variables. And page three is where you see the flying versus driving calculations. For ease of use, I have locked the Fly-Drive calculator. But, you are welcome to unlock it for editing. The password is “WorkSmart” to each of the three worksheets. Google Maps for finding driving distances and drive times. Gasbuddy for find the price of gas for an area. Tollsmart to calculate tolls for your trip. Fly or Drive Calculator Mircosoft Excell File. Use WorkSmart as the password to unlock spread sheet for editing. Do you have any tips of your own? If so please leave a comment at the bottom of this page.